The latest labour market statistics served up by Statistics Canada indicate a number-of-jobs increase year over year, in January 2019, of +1.8% and a nation-wide unemployment rate of 5.8%. In an earlier article ("Canada’s +67,000 January Jobs Number Launches Year on Fast Track"), there was discussion of industrial sub-sector jobs performances, along with commentary on how workers are faring in the provinces. This current article takes the analysis deeper geographically and looks at labor markets in Canada’s 33 Census Metropolitan Areas (CMAs). Table 1 ranks Canada’s CMAs in two ways: (1) by year-over-year jobs growth, from fastest to slowest; and (2) by latest unemployment rates, from lowest to highest. Ranking (1) appears on the left-hand side of the table; ranking (2) on the right-hand side. Only three cities appear among the ‘Best 10’ for both strong jobs growth and minimal unemployment rates – Guelph, Abbotsford and Kitchener-Waterloo. Those three cities have been placed within coloured shading. It seems fair to conclude that they currently offer the country’s sparkiest labour markets. 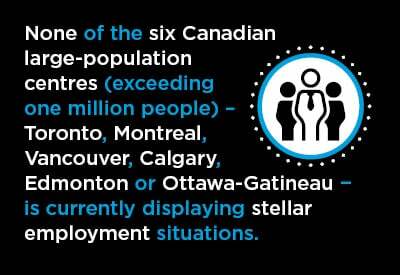 None of the six Canadian large-population centres – Toronto, Montreal, Vancouver, Calgary, Edmonton or Ottawa-Gatineau − is currently displaying stellar employment situations. Edmonton (+4.4%) is doing best for year-over-year jobs growth but is only ranked ninth among all Canadian cities. Vancouver (+2.2%) is next for hiring among the ‘Big 6’, but is in 16th spot overall, halfway down the list. Toronto (+1.1%), Montreal (+1.0%), Calgary (+0.8%) and Ottawa-Gatineau (+0.7%) appear in a cluster, one after another, in positions 19 through 22. They’re all experiencing jobs growth below the national average (+1.8%). With respect to unemployment rates, Vancouver (4.8%) has the lowest among the ‘Big 6’ and is ranked a respectable 6th among all 33 CMAs on the right-hand side of Table 1. Ottawa-Gatineau (5.2%) claims 13th place, but then it’s a long drop to Montreal and Toronto (both at 6.1% and tied for 26th), Edmonton (6.4% and a placement of 29th) and Calgary (7.3% and a placement of 32nd). There were 3 in latest month: Guelph, Abbotsford & Kitchener … Best labour markets in the country. Based on average of latest three months.